People have been asking lately about laser therapy, so I thought I’d explain it a little and sneak in a quick condition at the same time. 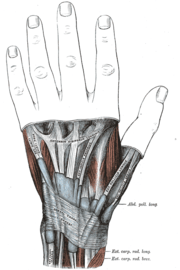 De Quervain’s is the name for tenosynovitis of the thumb extender and abductor muscles. Which is to say the tendons that move your thumb hurt at the wrist because inflammation isn’t allowing them to move properly. It is more common in women, but anyone doing repetitive motions with their thumb such as typing, cashiering, mechanics, etc. is susceptible. If you have it you may notice a “squeaky thumb,” pain when moving your thumb and decreased grip strength. In my experience this condition doesn’t usually go away on it’s own. Similar to carpal tunnel syndrome it just keeps coming back unless you receive proper care. Many things are done for treatment of this condition. Chiropractic manipulation and massage of the area are beneficial as well as reducing use. You’ll likely need to talk with your employer about decreasing or changing your duties for a time while you heal. There are also many electrical modalities that are beneficial for de Quervain’s. That’s where the Cold Laser comes in. Cold Laser is called many names but it is all the same thing, particular light waves that have been found to increase cellular metabolism. In essence when exposed to these wavelengths of light your cells heal faster, and hurt less. That’s a good thing. It’s an odd sort of treatment because you normally don’t feel anything at the time. Kind of like magic with good research behind it. We just put this wand with a laser or LEDs on the injured area and hold it there for a few moments with the light on. The reason I bring Low Level Laser Therapy (LLLT) up with this condition is the relief time. Generally speaking my patients are able to notice effects of LLLT within the first day, but I had a patient with de Quervain’s who claimed instantaneous relief with LLLT. It was amazing to me and worth reporting to you. So, if you have pain at your wrist from thumb movement visit your chiropractor and ask them about Cold Laser Treatment. This entry was posted in Chiropractic in General, Chiropractic Research, Health Conditions, RSI, The US Military & Chiropractic and tagged Chiropractic, Chiropractor, Cold Laser, Low Level Laser therapy, pain, relief, RSI, wrist on December 10, 2008 by cmnacnud. I have deQuervain’s (as a result of being a new mom most likely) and have gotten great relief from a series of adjustments and ultrasound therapy. My chiropractor just got a laser therapy machine, so if I have flare ups, hopefully we can try that. Too bad my brother-in-law went under the knife for his carpal tunnel!